By Wilburn Roberts, contributor @ The Shooter’s Log. Used with permission. SIG modified the basic design of the hammer-fired SIG P250 in the SIG P320. In my estimation, the new pistol exhibits a faster lock time, a smoother trigger action and greater practical accuracy, certainly a plus for self-defense shooters such as Members of Texas & U.S. Law Shield. The P320 is light enough while offering service grade accuracy. For those preferring ease of maintenance, a simple operating mechanism, and SIG reliability in worst-case scenarios the P320 is an excellent choice. The SIG P320 strikes a familiar outline. The P320 is an adaption of the P250 to a striker-fired mechanism. The frame, magazine and barrel are the same as the P250. The SIG P320’s most interesting feature is its versatility and changeability. The P320 is a modular design. You may change the grip frame and slide around the serialized metal chassis as well as exchange the grip frame for larger or smaller units. Institutional users can keep a few sets in stock to fit all hand sizes. The rest of us will be careful when we order. The test gun came with the medium grip, full-size frame, which seems to suit most shooters across the board. 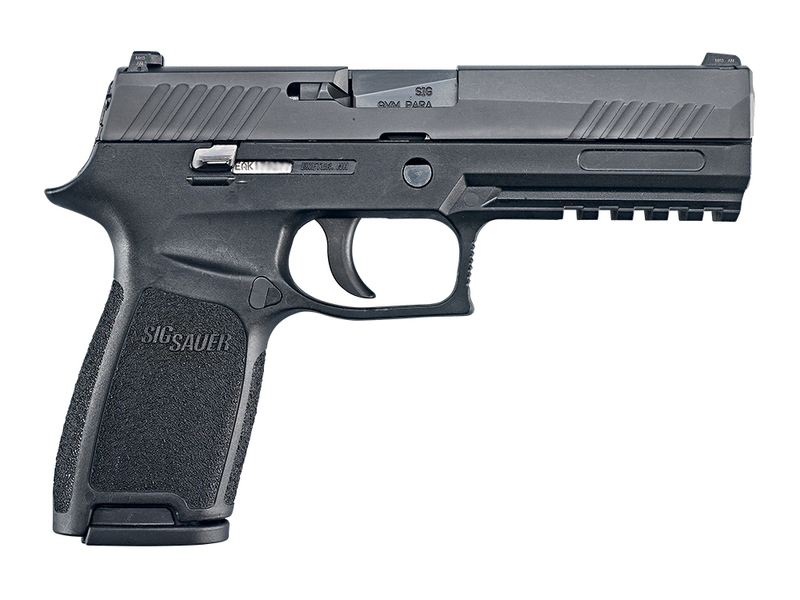 The SIG weighs 29.5 ounces (unloaded) and has good balance. The slide has a Nitron finish and features forward cocking serrations, which offer sufficient purchase for manipulation. The controls include a slide lock, magazine release and take down lever. The SIG magazine release is a trapezoid shape. I had the impression of pressing forward as well as in with this release. It is a good feature of the P320. Field strip is simple enough, using a takedown lever. The pistol does not have to be decocked for disassembly, a plus. The grip frame is pebbled on the front strap, back strap and each side in the same pattern. It worked well for the author and other shooters. Magazine capacity is 17 rounds. There are grooves in the handle to allow a strong grasp on the magazine in the event of a stuck magazine—which isn’t likely to occur. Trigger compression is consistent at 7.75 pounds. While classed as a double-action only trigger, it behaves more like a single-action trigger. The more you use this trigger, the more you appreciate it. You can accomplish good shooting with this action. The sights are steel in the popular 3-dot white outline design. The SIG sights are dovetailed in place both front and rear. Two magazines accompany the SIG along with a plastic range holster. Part of the firing evaluation was accomplished with Fiocchi’s reliable and affordable 115-grain FMJ load. I drew the P320 and fired at man-sized targets at five, seven and 10 yards. The pistol came on target quickly. Fast recovery was the rule. Trigger compression is short and reset fast. Trigger travel is about .4 inch. There were no failures to feed, chamber, fire, or eject. The SIG P320 is comfortable to fire. In combat drills, the SIG P320 made a good showing. In absolute accuracy, the pistol exhibited an average of two to three inches in accuracy with different loads. Like all quality handguns, the SIG prefers one load to the other at long range, when firing for absolute accuracy. However, at seven yards the pistol put all of the rounds in the magazine into one hole. At 15 yards, a bit longer than the average engagement range, the SIG P320 put five rounds of practically any service load into a two-inch group. I was able to test fire the SIG extensively. I moved to a heavyweight load preferred by many shooters. Cheap does not have to mean rock bottom. 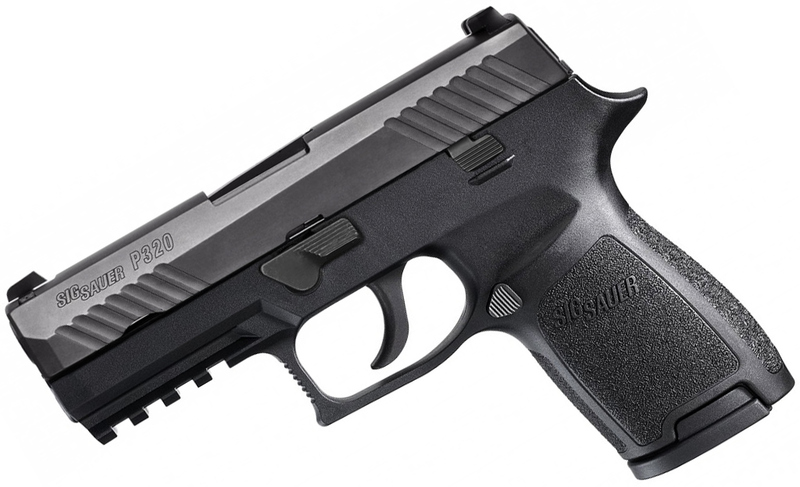 SIG Sauers are not normally associated with “cheap.” However, by comparison, the SIG P320 is significantly cheaper than previous models and still features SIG’s “To Hell and Back” reliability. The Fiocchi 147-grain Extrema proved accurate, reliable and with less felt recoil than the 115-grain load. This loading penetrates deeply and expands modestly. I also used the Winchester 115-grain JHP in the Personal Defense line. Affordable but effective, this loading is fast enough to ensure expansion. I also fired a quantity of the Winchester 115-grain Silvertip, a proven defense loading. All loads were reliable and gave good accuracy. Do you have a SIG P320? Do you agree with the author’s review? Let other members hear about your experiences in the comments section below. To see the original article @ CheaperThanDirt.com, click here.